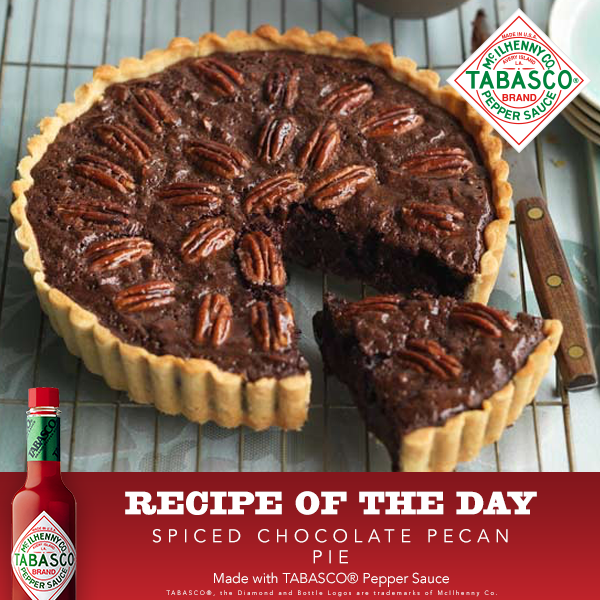 Are you adventurous enough to spice up your Chocolate Pecan Pie? Try this recipe! 2. In large bowl, beat corn syrup, sugar, butter, cinnamon, nutmeg, vanilla and eggs with wire whisk. Stir in pecans and ¾ cup of the chocolate chips. Spread evenly in crust-lined plate. Cover crust edge with strips of foil to prevent excessive browning. 3. Bake 30 minutes. Remove foil; bake 15 to 25 minutes longer or until pie is deep golden brown and filling is set. Cool 15 minutes. 4. In small microwavable bowl, microwave remaining ¼ cup chocolate chips and the shortening uncovered on High 1 minute; stir until smooth. Drizzle chocolate over top of pie. Serve pie warm or cool. Top each serving with whipped cream. Store covered in refrigerator.